That is crazy! It gave me tingles… Did you ever touch it on those days when you saw it in the garage? That’s a good question, Carie, and I had to stop and think. I don’t remember touching it, but I did stand next to it a number of times. 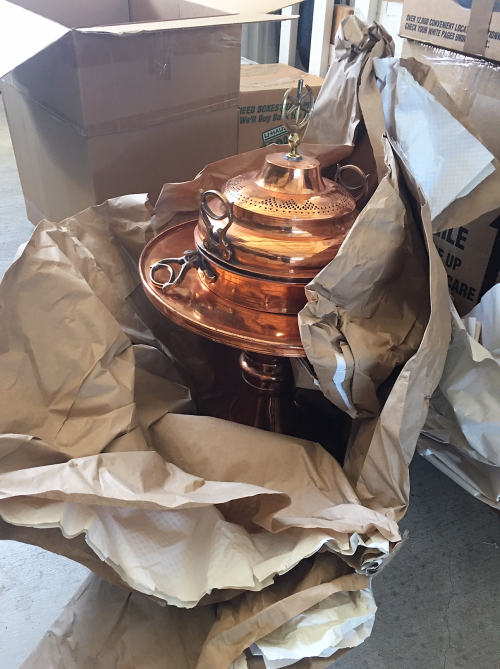 It was in a grouping of four pieces: a standing lamp, a 4′ tall decorative pitcher, the brazier and a brass trash can. 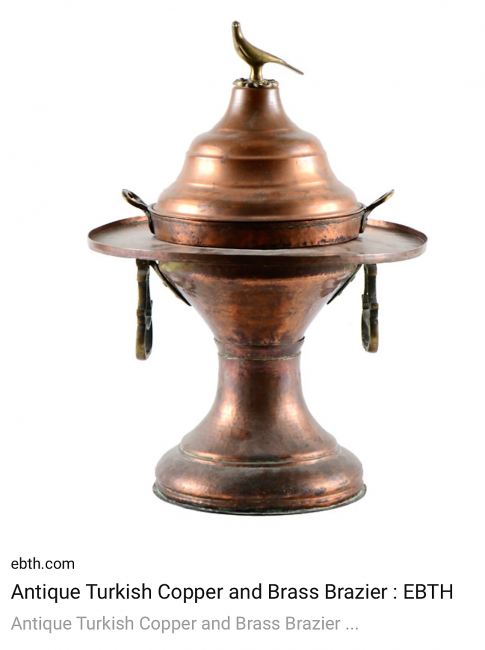 Over those weeks I found places in the house for everything except the brazier. 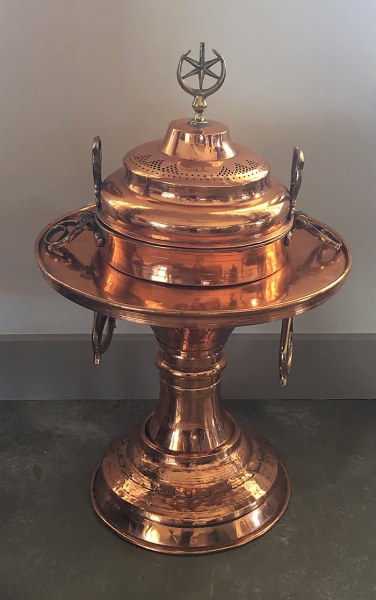 It was after the next-to-last item in the grouping found a home that I discovered the last item–the brazier–had disappeared. Omg if that happened to me I would think I was being gaslighted.!! Glad it turned up.Its a beautiful piece!!! Gaslighting! That’s a scary thought. I’m glad it didn’t occur to me! Thank you, Susan. I’m very glad to have it in the house where it belongs! I have always thought that you, my dear friend, have heightened sensibilities in many respects. Just one of the many things to love about you. Although I wonder if maybe your mother had a hand here, like she did with the ring? I guess it may have been a disconcerting episode for you, but as a little story, this rang all the bells- a little humor, a little fun, kind of spooky, but safe because of home and family….I think you should keep it in mind for your next novel. A ghost story maybe? The Brazier is a beautiful piece, by the way. I’m glad it is now residing happily with you in the forever home. And may I say, it takes one to know one, Oh Claire of Heightened Sensibilities herself! I wondered about my mother too. It reminded me of the ring episode, for sure. I like your idea of a ghost story! Sort of M.R. James-ian. When I write it, I’ll look toward the spot where the brazier now resides for inspiration. And it better BE there!! It’s a beautiful piece, and I’m glad it decided to make its reappearance! Me too, baby, me too!! Love the lacquer and shine…who cares if the antiquarians fuss? It’s beautiful…and it clearly wanted to gdt out of that box! Boy, no kidding! And so desperately, too! I guess I’ll never know why, but I can’t help wondering . . .